I have been longing to make my own facial cream for a long time. The ingredients in facial-creams were the initial reason that I started to make my own products. When I saw a facial cream containing formaldehyde, an agent that we use in cell culture to kill cells, I was shocked. With growing interest (and disgust) I read more and more about other toxic and alarming ingredients (e.g. EDTA, Parabens) in the list of my facial-cream. It took me about 6 month of experimenting to come out with a product that is just as good as a commercially available one. Just for you…. 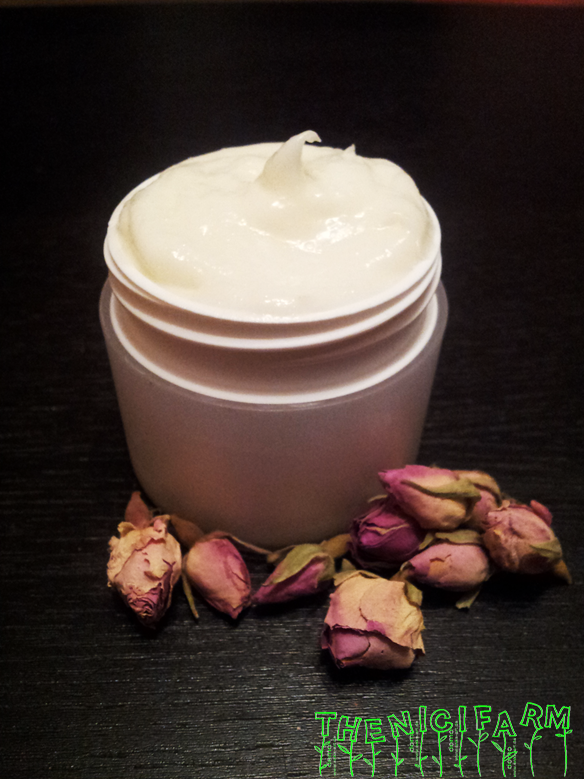 Put rose water in one heat proof vessel (water phase) and shea-butter, tegomuls and oil in a second one (oily phase). Place both vessels in a water filled pot and heat until the oily phase has molten and is translucent. Take out of the water bath and fill rose water under a constant stream, constantly stirring into the oily phase. Stir, stir, stir….stir until the cream has become hand-warm. The cream goes through different phases. First it becomes stiff like a pudding, then more liquid and with more stirring the cream becomes creamy. This process takes about 5 minutes. Now add the essential oils and keep mixing. Then place into a cold water bath and keep stirring until cold. Now you can scoop the cream into clean containers and close them with a lid. At room temperature the cream can go bad in a few weeks. If you keep the cream cool it stays good for a very long time. This entry was posted in You're beautiful! !.